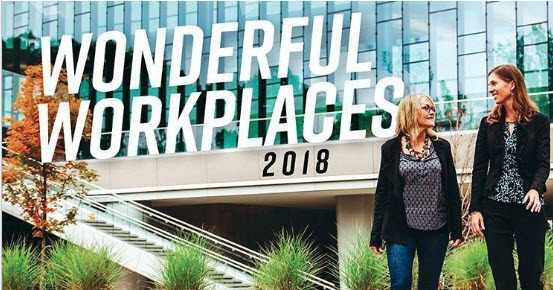 We are excited to announce that Consumers Credit Union has been selected by 269 MAGAZINE as one of Southwest Michigan’s Wonderful Workplaces! This award celebrates outstanding efforts made by businesses that express vibrant cultures built on a foundation of strong core values, community service and detailed attention to the employee experience. This award will be recognized in the Holiday 2018 issue of 269 MAGAZINE. Consumers’ selection for this award specifically called out our wellness program—one that was built from the ground up to engage employees where they are at. Physical, mental and emotional wellness are supported through workout classes, an on-site success coach, choices in nutrition, a wellness app and more. Our commitment to supporting the wellness of our members, communities and employees was the driving factor in this award selection. “We know it is the right thing to do, but it also gets real results,” said Lindsay Land, vice president of operations. Thank you 269 MAGAZINE for selecting us as one of Southwest Michigan’s Wonderful Workplaces! If you are interested in working for one of the best of the best, check out our career opportunities here. Get awesome new content delivered straight to your inbox.